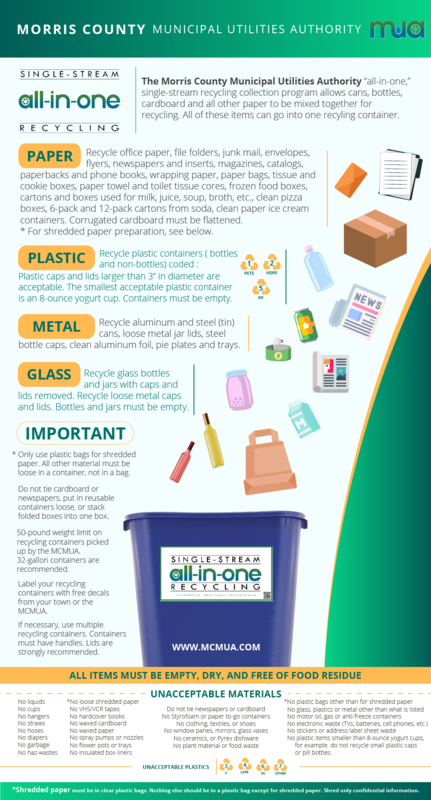 The MCMUA's "all-in-one" single-stream recycling collection program applies only to participating municipalities that contract with the MCMUA for recycling collection services. 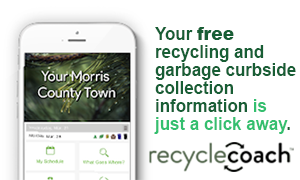 Click here for specific information about all Morris County municipal recycling programs. 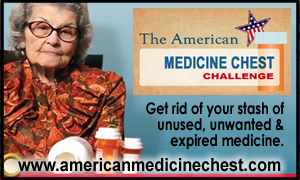 50-Pound Limit - There is a 50-pound limit on the weight of any individual container set out for curbside recycling collection by the MCMUA. If you have more than 50 pounds of material to recycle, you must use multiple recycling bins, each weighing no more than 50 pounds. Don't Tie the Paper - The single-stream facility and its screens work when paper is loose and two dimensional. Do not tie or bundle any newspaper, corrugated cardboard, magazines, junk mail or any other paper; just put all loose paper into the same recycling container with all of the other material. Flatten or cut corrugated as needed, and again, use additional containers when you have more than 50 pounds of recyclables. Clean Food Off Recyclables Please wipe and clean all food off the recyclables prior to putting them into the recycling bin. This will help to keep everything clean, dry and bug-free. Empty the Liquids Please drain all liquids out of the recyclables prior to putting them into the recycling bin. What About Bottle Caps? Bottle caps fall through the screens and cracks in the single-stream recycling facility. Put loose bottle caps into the garbage - not into the recycling bin. What About Shredded Paper? First and foremost, as little paper as possible should be shredded - only those pieces of paper with information on them that you don't want others to see. 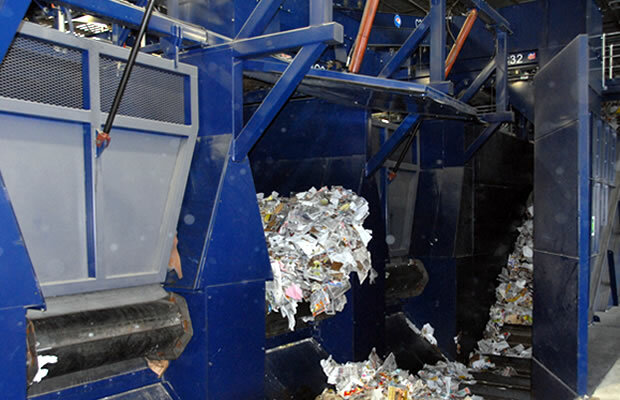 The less shredded paper there is in the recycling stream, the better it is for the recycling process. Because shredded paper is so small, it doesn't get sorted with other paper, and it winds up in the trash at the end of the system. This is why it is required for shredded paper that will be set at curbside for collection or that will be deposited at a local recycling center should be put into clear or light-colored plastic bags, such as grocery bags. Dark-colored trash bags should not be used. Tie knots to securely close the top of the bag. Do not put any other paper, recyclables or trash into the plastic bags containing shredded paper. Note: the only plastic bags that are to be put into recycling receptacles in the "all-in-one" single-stream curbside municipalities are those containing shredded paper. 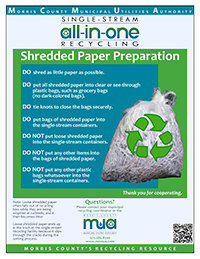 Click here to read a July 6, 2012 press release regarding guidelines for recycling shredded paper as part of the "all-in-one" single-stream recycling program. Click here to see a list of shredded paper vendors currently in the MCMUA's materials database. Are Pizza Boxes Recyclable? Pizza boxes are acceptable if they are clean and without grease. From our experience, most pizza box tops will be recyclable. The bottom of the pizza box from a plain pizza pie that was delivered with wax paper between the pizza and box is likely to also be clean enough to be acceptable. A pepperoni pizza is likely to have greased up the bottom too much and would make the bottom of the pizza box non-recyclable. The wax paper from the pizza box is not recyclable and should be placed in the garbage. We wish it was an easy "Yes/No" answer, but it really depends on how much grease gets absorbed in the box and whether someone is willing to tear off the top from the bottom when the bottom is dirty but the top is clean. Need to make business recycling easier? The Recommunity recycling facility accepts materials from businesses as a single-stream mix or with bottles and cans kept seperate from paper. 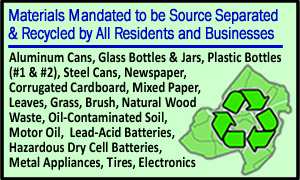 Please contact Bob Anderson of ReCommunity at (973) 214-1137 to establish an account prior to delivering recyclables to them directly. 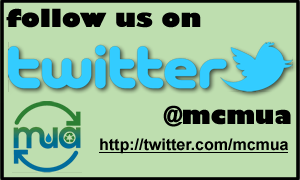 The MCMUA may also be able to provide single-stream recycling collection for your business. Contact us about how we can help you remain compliant with your recycling mandates. Please be aware that corrugated cardboard isn't the be-all and end-all of recycling for business. 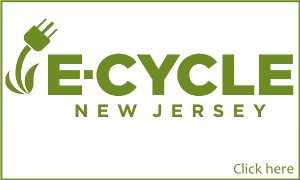 Click here to read about recycling mandates for Morris County businesses. The MCMUA role in single-stream begins at curbside and ends on the tipping floor (a concrete pad) at ReCommunity where recyclables are dumped (or tipped) from collection and roll-off vehicles. From here on ReCommunity takes on the responsibility to separate the single-stream mixture into salable commodities such as baled paper, plastics, metals, etc. ReCommunity then uses front-end loaders to place the single-stream recyclables in giant hoppers awaiting their turn to being the recycling roller coaster ride of their lives. The single-stream recyclables are fed onto an inclined conveyor belt to begin the 45-second journey through ReCommunity's single-stream separation system. The material is conveyed to a quality control hand-picking station where workers remove what was incorrectly put into someone's recycling bin. Many plastic bags and other contaminants are removed here. Removing contaminants is labor intensive and expensive, so it's very important to put only the acceptable recyclable materials into recycling bins at home and businesses. From the picking stations, the single-stream material is fed into a series of rotating disk/star screeners that go from narrow to wider gaps between the disks as the material floats uphill. These screens separate the two-dimensional material (paper) from the three-dimensional material (cans, bottles, and the other containers). This is the primary means by which the single-stream materials are processed into various subsets. From here on, the recycling mix is no longer considered single-stream. From the disk screens, the separated materials fall between the disks onto a series on conveyor belts that transport these materials to a variety of of picking stations and separation technologies. The conveyor system is a sophisticated transportation network that efficiently delivers material to subsequent processing stations. The conveyor belts deliver fiber (paper) to other conveyor belts where hand-pickers clean the material streams. There are conveyor belts for newspaper, mixed paper, and corrugated cardboard. Finally, there is a picking station where contaminants and paper are removed from bottle and cans prior to them being directed to the original and bottle and can recycling facility located next door at 103 Iron Mountain Road. For over a decade, the MCMUA has delivered bottles and cans to the recycling facility located next door at 103 Iron Mountain Rd. Prior to 2011, FCR, Morris (the company that is now known as ReCommunity Recycling operated the facility. Bottles and cans from the single-stream facility at 105 Iron Mountain Road are transported from that location to 103 for processing. There are plans to upgrade the operation at 103 during 2012 to bring even greater recovery technologies to the system. After the material is picked and clean to the best capabilities of the system at the single-stream facility (105 Iron Mountain Rd), it is conveyed and staged in a series of seven bunkers, two for residue (garbage destined for the MCMUA Mount Olive transfer station), one for rigid plastic, and the remaining for corrugated, newsprint, and mixed paper. On demand, the material is automatically extracted from each bunker after a giant automatic door is hydraulically opened, gaining access to the recyclables in the bunkers. From the bunkers, the material is conveyed up to a baler that compacts the recyclables into bales tied in metal wire ready for sale and transport. The bunker system and the sophisticated automation technologies enable a variety of materials to be stored and automatically transported to one single baler. A forklift collects the finished bales as they are extracted from the baler and places them in storage areas waiting for transport to recycling markets throughout the world. Video tour from start to end of the single-stream recycling process. Tipping floor operations featuring the MCMUA recycling collection fleet. Close up of rotary screens breaking up the single-stream. 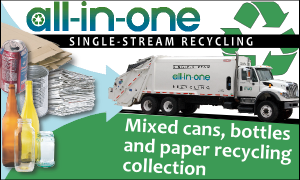 Collection Efficiencies - With all-in-one recycling, the single-stream mix of recyclables (bottles, cans and paper) can be collected at curbside using one truck. In the past when paper was collected separately from the cans and bottles, two trucks were used to collect this dual-stream mix of recyclables. Therefore, the change to single-stream recycling reduces the resources used to collect the material. Fuel, worker hours, time, traffic, greenhouse gas emissions, accidents, road wear, and overall costs are all reduced as a result of switching to single-stream recycling collection. Lifestyle Improvement - Recycling is a lot easier now that it is all-in-one single-stream. No longer does one have to maintain multiple recycling bins for different recyclable materials. All of the common household recyclables now go together in an all-in-one container. Additionally, bundling and typing newspapers is no longer needed. Single-stream recycling simplifies life a wee bit. Additional Materials - The MCMUA's all-in-one single-stream recycling program allows materials to be included in the recycling mix that were previously prohibited. These additional materials include wet-strength cardboard used for beer, soda and frozen food boxes. Also added are polyboard cartons and boxes used for milk, juice, soup, broth, etc. Finally, several new types of plastics can now be recycled. In addition plastic bottles coded #1 and #2, plastic containers (not just bottles) coded #1, #,2, #4, #5, and #7 can be recycled. Rigid plastics such as toys, buckets, laundry baskets, and non-polyvinyl chloride (PVC) plastic furniture can also be recycled. If the rigid plastic items fit into a curbside container collected by the MCMUA, they can be included in the single-stream mix. If the rigid plastic item is too large to fit in the curbside container, one must see if large rigid plastics are acceptable at one's local recycling center in a container for rigid plastics only. Most municipalities participating in the MCMUA curbside collection program provide recycling depots that accept large rigid plastics. The types of plastics currently unacceptable in the single-stream program include #3 (PVC), #6 polystyrene (Styrofoam®), plastic wrap, and plastic bags. Note: It is permissible to put shredded paper into translucent or clear plastic bags; these bags must be tightly closed. Please put unacceptable plastics into the garbage. Additional Tonnage - Because of the inclusion of new materials and the convenience of single-stream recycling, it is expected that recycling tonnage will rise. The MCMUA conservatively anticipates initial increases in the tonnage of recyclables collected in the range of 15%-25% by weight when compared to the quantities of recyclables collected prior to the implementation of single-stream. This also will increase revenue from the sale of the additional tons and has a corresponding decrease in the quantity of material disposed of in the trash and the associated savings related to landfilling less garbage. In-county Facility - The ReCommunity recycling facility employs 28 material sorters and 36 employees in total. The forward thinking of the MCMUA helped bring this investment in green technologies and jobs to Morris County. 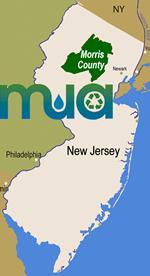 Community Partnership - The MCMUA established single-stream recycling in Morris County by developing a public/private partnership between the private sector (ReCommunity Recycling, Mine Hill, NJ), participating municipalities and their residents, and the MCMUA itself. 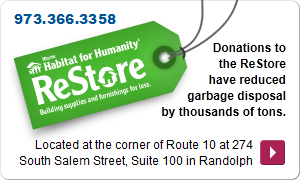 Working together as a community, all can all can help to make this single-stream recycling venture a success. By delivering clean recyclables, prepared in accordance with the materials preparation requirements to ReCommunity's single-stream recycling facility, all will share in the profits generated by marketing the recyclables. On the other hand, the more contaminants (garbage) in the single-stream mix, the less money all will make. The MCMUA has entered into contracts with both ReCommunity Recycling and Morris County towns establishing partnerships benefiting everyone when recycling is done properly. The better the recycling, the more all will share in the profits and environmental benefits associated with single-stream recycling! Optimizing the single-stream mixture by including valuable recyclables and minimizing garbage improves the bottom-line of the recycling facility and the shared profits of the contracting partners. Aluminum - When aluminum is recycled, a tremendous amount of energy and resources is conserved; therefore, aluminum is a very valuable commodity. All empty aluminum cans should be recycled. New to single-stream recycling is the inclusion of the aluminum foil, trays and pie plates (no food residue allowed). Paper - Corrugated cardboard, chipboard, newspaper, junk mail and magazines are all in great demand by recycling markets today and bring in good revenue. 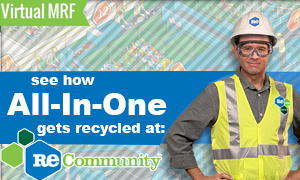 Everyone should recycle all the paper that is acceptable in the all-in-one single-stream recycling program. Most paper/cardboard is now acceptable as long as it is not contaminated with food or grease, is not wax coated and/or is not a sticker or a label. Note that while used stickers and labels do not have to be removed from paper, new stickers and labels are not recyclable and can interfere with the machinery. Plastics - Made from petroleum products, plastics can be expensive to manufacture and require a non-renewable resource to produce. As such, the demand for recycled plastics is high and generates substantial revenue for the recycling program. 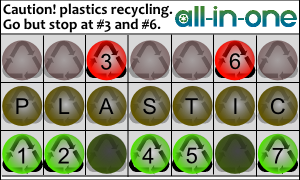 As of 2019, only plastic coded #1, #2 and #5 are acceptable in the all-in-one single-stream mix and add significantly to the value the recycling mix. Plastics coded #3 PVC, #4 LDPE, #6 polystyrene (Styrofoam) or #7 other are unacceptable in the all-in-one single-stream system as they contaminate the process and cost time and money to pick out and put into the residue(garbage). 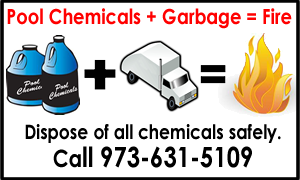 Hazardous Waste - Hazardous waste can be dangerous to curbside recycling collectors and facility operators. No liquids, especially hazardous waste; are to be included with single-stream recyclables. Click here for information about the MCMUA household hazardous waste program through which hazardous waste can be managed safely and correctly. Garbage - Garbage belongs in the garbage. Even though human beings and equipment screen for unacceptable materials, garbage does not belong in in the single-stream recycling mix. 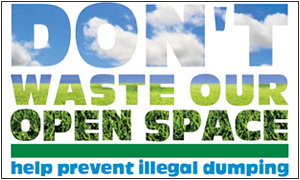 All food waste, garbage and debris should be removed from recyclables prior to their being put into the recycling bin. The cost of every ton of garbage extracted at the single-stream recycling facility is deducted from the profits the community shares in the marketing of the recyclables. Plastic Bags or Film - While single-stream recycling has enabled the MCMUA to collect additional types of plastics, plastic bags and/or wrap are not acceptable in the single-stream recycling mix. Plastic wrap gets twisted in the rotating screens and is a nuisance material that must be cleaned from the recycling machinery. Plastic bags filled with recyclables are not to be put into the recycling bin; empty all plastic bags and discard them in the trash. Liquids - Liquids do not belong in the single-stream recycling mix. For instance, a water bottle with some water in it will usually be too heavy to be captured by the single-stream recycling process and will then fall through the cracks and end up as residue (garbage). Additionally, liquids are heavy - transporting them by truck is a waste of effort and energy. Scrap Metal - Large pieces of metal can damage the single-stream recycling equipment. Scrap metal is never to be put into curbside recycling bins. 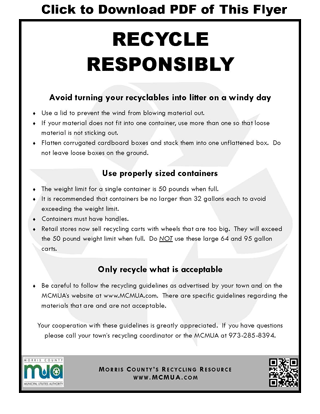 Click here for a flyer describing unacceptable items that are not to be placed in the single-stream recycling container. The only metals allowed in the single-stream recycling mix are aluminum cans, containers, foils, trays and pie plates as well as steel (tin) cans, staples and paper clips. Scraps metal is acceptable at quite a few municipal recycling depots, as well at privately owned and operated scrap yards. Lawn signs, such as those used during elections or by realtors, are not acceptable in a single-stream recycling container. If your town has a large rigid plastics container at its recycling depot, the corrugated plastic sign may be recycled there. The metal legs on the sign may be recycled in a scrap metal container or with a scrap metal dealer. 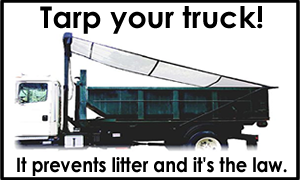 Contact your municipal recycling coordinator to see if large rigid plastics and scrap metal can be recycled at your municipal recycling depot. Poly bag lawn signs are not accepted as rigid plastics or in the single-stream curbside bin and must be discarded in the trash. 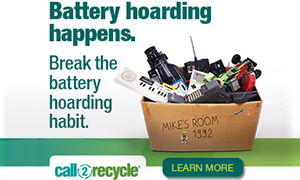 Batteries - Batteries of ALL types (alkaline, Li-ion, rechargeable, electronic device, automotive, button cell like those used in hearing aids, watches, and garage door openers) pose many dangers to employees and equipment and do not belong in the recycling bin. The safety of recycling facility employess is an important concern. Batteries can cause serious burns to the eyes and skin and can also cause fires at recycling facilities. 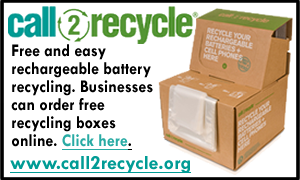 Click here to learn about the proper disposal and/or recycling of batteries, but in no circumstance are any batteries to be put in the all-in-one single-stream recycling container.